AN ENTERTAINING sun-drenched final scheduled home Ladbrokes Championship match ended in depression for the home fans as their side conceded five goals for the second week running. In front of a 942 crowd, with visiting fans outnumbering the home support, Sons lost 5-2 to Falkirk, and have only an away game at Dunfermline next Saturday before the relegation play-offs. AFTER an even first half Falkirk went on a goal spree and beat Dumbarton 5-2 in in the Championship clash at the YOUR Radio 103FM Stadium this afternoon. Dumbarton went behind to Alex Jakubiak's clever lose-range backheel on 19 minutes. 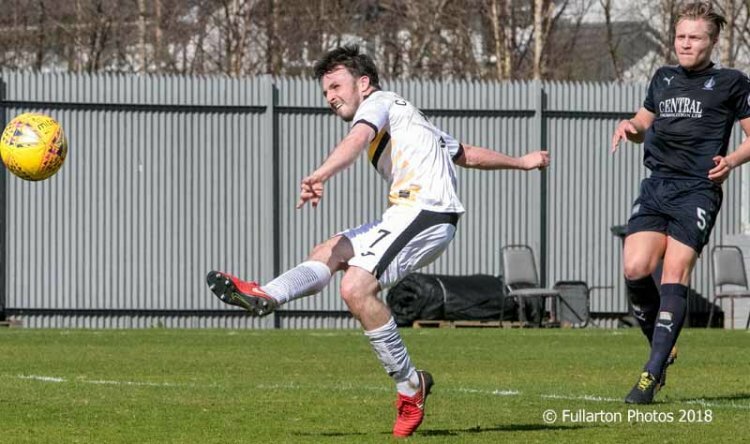 Calum Gallagher slid the ball home to level before the break (pictured), but Louis Longridge then put the Bairns in front again two minutes after the restart. Then Tommy Robson (59 minutes), Craig Sibbald (70 minutes) and Joe McKee (86 minutes) added further goals for Falkirk. Three minutes before the end Liam Burt replied for the home side with an accurate shot to narrow the gap.